Palma Choralis® was formally founded in 2006 by Marcello Mazzetti and Livio Ticli, who are even now the nucleus and the musical/artistic directors. Palma Choralis consists of a Research Group and an Early Music Ensemble that always work in deep synergy. BRIEF INTRODUCTION • Palma Choralis’ history is that of a constant growing, a maturing, a continuous development that has been always leaded in unison. The Founder members had come from different educational background: Marcello from a training in Classical Guitar, Music Composition, Orchestral and Choral Conducting, while Livio in Classical Piano, Historical Keyboards, Voice and Music Composition. In 2002 they met in Cremona when they both started their studies at the Musicology Faculty, attending courses of History of Liturgy, Renaissance and Medieval Music, Historical Performance Practice or Theory and Practice of Medieval/Renaissance Music Composition Techniques. With time their interest in Early Music has grown steadily, so that they decided jointly to enroll at the Accademia Internazionale della Musica di Milano. There Marcello began his study in Lute and they both have attended the Renaissance Polyphony course. Finally they started dealing in practice entirely with Renaissance Repertoire (15-17th cent.). Of great importance was the experience from this period with Prof. Giacomo Baroffio, whom they have met at the Pavia University. Thanks to him they have got closer to Gregorian Chant and have deepened the bond between Liturgy and Sacred Singing. As a result a new interest has arisen that guided them towards the orthodox, Byzantine, medieval chant and rite. After they studied Middle Byzantine Music Notation under Prof. Sandra Martani (Pavia University), in 2005 they visited Iaşi (Romania) where for the first time they experienced the Divine Liturgy and sang together with Byzantion Ensemble (A. Sirbu dir. 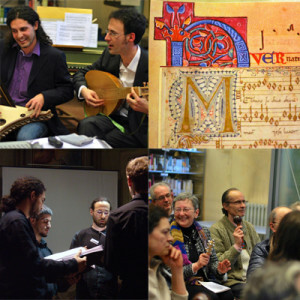 ), one of the most important Groups that performs musica psaltica (Byzantine Music) in Europe. AIM • Building on these premises (Renaissance Music Practice, Gregorian and Middle Byzantine Chant and Liturgy) a wish arises, to found a new entity which could embraces both aspects, practical and theoretical ones, inside a permanent Workshop where early repertoire could be brought to life again and where it was possible to reflect on actual possibilities of performing and on the spirit that animated Early Music. With it, the essential key word is «starting from voice and singing» (i.e. obviously from listening): as the early Pedagogy teaches, the first Music lesson it was always sung and even in Classical Age was of greatest importance also as element of the physical education. PROJECTS • We believe it is important to put first complex, multifaceted and wide-ranging projects. Therefore Palma Choralis shrinks from doing ‘anthology-concerts’ and it prefers e.g. performing the tale of a story (like in a drama) and in any case integrating music in all specific contexts which it was meant to be for (e.g. the rite). Hence it is central having a dialogue with the framework where we work: the connection with local institutions becomes also essential in order to develop projects that aim to promote cultural assets (Traditions, Music, Arts, etc. ), as musical events correspond to an opportunity to put in contact the public with its own local cultural heritage. Although Palma Choralis pays always particular attention to needs of scientificity (required from actual, philological and musicological studies), it values making available the result of its own research to general public, mixing methodological severity and freshness of a high quality artistic product. With time Palma Choralis has changed and even now it is constantly on the move, as you can notice from the Tabula Gratulatoria. Besides the founding core (M. Mazzetti and L. Ticli), Palma Choralis consists of many musicians and researcher from Italy and from all over the world.